Designed for customers with higher production demands, the Duplo DSF-6000 Sheet Feeder offers a high stacking capacity of 24” for maximum productivity and an increased flexibility with paper sizes. 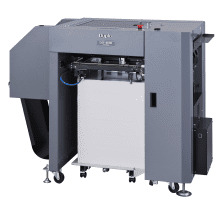 Configurable with the DBM-600 Bookletmaker or iSaddle, the DSF-6000 Sheet Feeder offers the ultimate solution for converting pre-collated digital or offset printed media into high quality booklets at up to 4,500 per hour. Equipped with a technologically-advanced Air Management System, the DSF-6000 provides an unsurpassed level of high speed performance that ensures consistent feeding of a wide variety of paper types and weights, from 64 gsm to 300 gsm, at a speed of up to 600 sheets per minute. The main tray offers a loading capacity of 24” (610mm), which minimizes reloading by supporting longer run times. 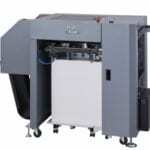 Three-side air separation and integrated static eliminator effectively handle the static common with digitally printed media. Optical and ultrasonic sensors accurately detect feed errors, should they occur.